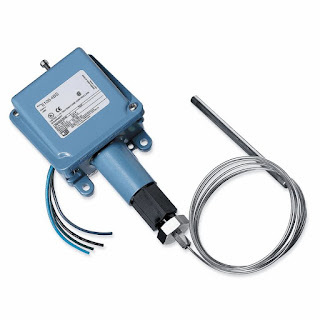 UE watertight and corrosion resistant temperature switch. Not all processes or operations require the use of state of the art technology to get the desired result. Part of good process design is matching up the most appropriate methods and technology to the operation. One method of changing the state of an electrical switch from open to closed in response to a process temperature change is a bulb and capillary temperature switch. The change in state occurs in the mechanical switch when the temperature of a process control operation crosses a certain threshold. Bulb and capillary switches have the advantage of operating without requiring an excitation voltage, simplifying their use in a given application. The physical operating principle behind the capillary thermostat relies on the use of a fluid. The fluid inside the thermostat expands or contracts in response to the temperature at the sensing bulb. The change in fluid volume produces a force upon a diaphragm or other mechanical transfer device. The diaphragm is connected to, and changes the status of, an adjoining circuit using a snap action switch. Because of their simplicity and comparatively modest cost, commercial versions of bulb and capillary switches find application throughout residential and commercial settings. Some common applications include warming ovens, deep fat fryers, and water heaters. 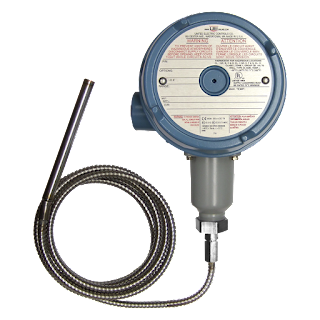 UE hazardous area temperature switch. Industrial versions of bulb and capillary switches are fitted with appropriate housings for the installation environment. Housings designed for hazardous areas, drenching or submersion, high dust or high corrosive environments are standardly available. Many switching options exist as well, such as high current ratings, SPDT, DPDT, dual SPDT, adjustable deadbands, and internal or external adjustments. Operation of the temperature switches is subject to a few limitations. The setpoint is most often fixed, so changing the setpoint accurately requires trial and error or a calibration procedure. The temperature range over which the switches are suitable is comparatively limited, with a matching of the bulb and capillary fluid system to the application temperature range a necessary task in product selection. Within its proper sphere of use, though, bulb and capillary temperature switches offer simple, reliable operation, with little requirement for maintenance. 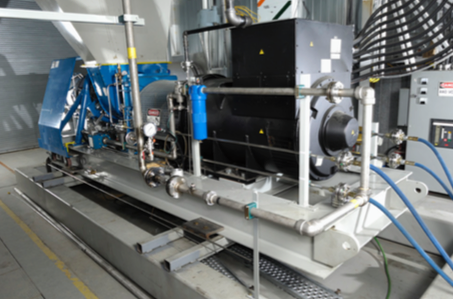 Time-tested, and application proven, these simple mechanical devices are still strong candidates for applications in any temperature control process. As with any process instrument implementation, we strongly suggest you share your application requirements with a knowledgable product specialists for the best solution. 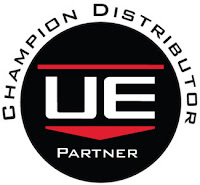 This is PART 1 in a series of training videos for the United Electric Controls One Series Safety Transmitter. Sadly, There are too many recent examples of catastrophic industrial accidents. New safety technologies exist today that can prevent or mitigate future disasters. 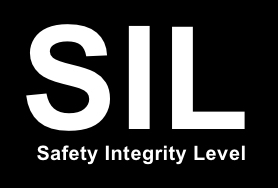 The philosophy of safety is changing - the focus on plant safety has changed from reactive to a proactive approach. End users have a new sense of urgency toward safety processes. The United Electric Controls (UE) Series One is a SIL-certified (SIL stands for safety integrity level) transmitter designed solely for safety, alarm, and shutdown applications, with reliability, speed, and fewer nuisance trips. It is also designed for both greenfield and brownfield installations, and is cyber secure. 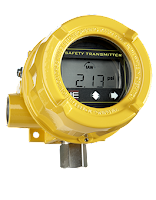 A typical safety loop consists of sensors (such as a pressure transmitter), controllers, and final control elements. 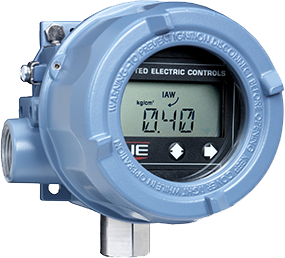 Most SIL-rated pressure transmitters require 300ms to communicate with the controller and up to 500ms for the controller to send a signal to the final control element (such as a valve). This may not be fast enough for critical applications. By connecting the One Series Safety Transmitter directly connected to the final control element, the signal speed is reduced to 100ms - a huge time savings when you're in the midst of a disaster. When used with blowers, pumps and compressors, the One Series makes up a complete safety system with a self-contained sensor, controller, and final control element (the switch) capable of SIL2 without additional safety instrumented function (SIF) components. The below document provides detailed information about the Series One.